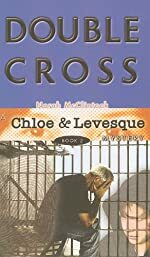 Review: Suspense, feat, predicament, and perplexity are all words that describe the book, Double Cross, written by Norah McClintock. This book is the second installment in the Chloe & Levesque Mystery series that will blow people’s minds away. The minute Chloe met Jonah; she thought he was a jerk. All she asked was if somebody was using the chair next to him!? Was that a crime? NO! But then why is she going to such lengths to prove Jonah’s father isn’t a murderer? Especially when she doesn’t even know if it’s true or not?! Chloe at last, pieces together what really happened to Jonah’s mother the day she died. The thing is, the closer Chloe gets to solving the murder mystery, the farther she gets from safety, until something unpredictable happens… Chloe has to solve this mystery with only the help of a few people. I really liked the book, it was very concentrated, and I think my heart skipped a beat when I found out what really happened! My favorite part though, is when Chloe goes to look for Jay, and finds out who really killed Mary Shackleton (Jonah’s mother), and who was in on the murder! I also like the part where Dave McDermott (the mayor) tries to push Chloe off the cliff. When I read this part in the astonishing story, I almost fell off my chair! On a scale from 1 to 5; I definitely rate this book a 4.5! I recommend this book to anybody who likes a good ole’ mystery book in their hands in a comfy chair! Also, Double Cross entertained me because my favorite type of book is a mystery. The author, created a great plot and dilemma, which make the book the such an enjoyable read! I know for sure, anybody who read this book would agree with me! I can’t wait for Norah McClintock to write a 3rd book in the series, I know for sure that it will have even more action, and plot. And of course, Chloe, with the help of her friends, will be able to solve the mystery once and for all! Review written by Karan (7th grade student). We would like to thank Raab Associates, Inc. for providing a copy of Double Cross for this review. Have you read Double Cross? How would you rate it? Just by reading the first 4 words of the review,I already started liking the book. it sounds like an AWESOME(or is it awsome?) adventure!Litteraly!I give Chloe & Levesque:Double Cross, on a scale of 5 stars, a 6.... out of 5!